To provide a reliable and affordable source of pure water 100% powered by renewable energy. Imagine a village using an off-grid, solar-powered water distillation plant to convert brackish or polluted water to clean drinking water. In July 2016, Apricus and AIL Research combined efforts to make this technology a reality. With product development well underway, small-scale field trials will start in late 2016 leading to a commercial product offering in late 2017. 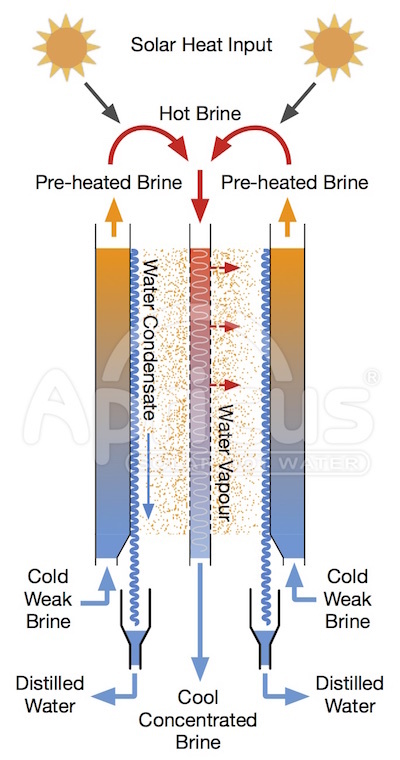 Apricus’ highly efficient distillation process runs almost entirely on solar thermal energy. The high pressure, high power pumps required by reverse osmosis (RO) system are avoided. The electricity required to run the low power circulation pumps and controls is easily provided by small solar electric panels (PV). The patent pending technology (US 2014/0305789 A1), referred to as Diffusion-Gap Distillation (DGD) has demonstrated impressive Gained Output Ratios (GOR) of over 12. GOR is a measure of efficiency for thermal desalination plants that equals the kilograms of pure water produced per kilogram of steam, or steam-equivalent thermal energy that drives the process. In sunny climates an Apricus DGD plant will supply each day over 40 Litres/m2 or 1 US gallon/ft2 of solar collector gross surface area. While solar energy is the greenest option, waste heat between 80~100oC or 176~212oF can also be used to drive the distillation process. The diagram below illustrates the DGD process. Apricus DGD plants will use less than 5% the electricity required by an RO desalination plant. The thermal energy that drives the distillation process is most cost effectively provided by a patented evacuated tube solar thermal collector design. The DGD process achieves and exceptionally high GOR by using the heat released by the condensing water vapor to preheat the brine almost to its maximum temperature. The solar heat input to the process is less than 10% of the recovery heat of condensation. A solar DGD plant also addresses the critical issue of energy storage; it efficiently operations 24/7 running on hot brine that is stored in low-cost tanks when solar energy is not available. Apricus DGD plants meet a wide range of needs ranging from processing polluted industrial wastewater to suppling drinking water to villiages, isolated military facilities or mining camps. 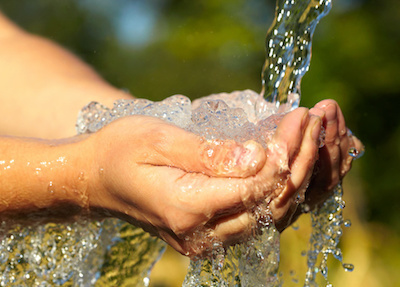 Securing clean, safe drinking water is set to become one of the greatest challenges of the 21st century. The Apricus DGD technology can help the world meet this challenge. Apricus is looking for technically competent partners around the world who are interested in participating in field trials and ultimately developing commercial projects in their local market. If you are interested in being involved in this exciting product please send us an inquiry.